It’s Christmas time. Time to put those Christmas lists together. I know something that’s going on my list. Maybe it should be on yours, too. I’m going to show you a chart of a bargain. Now, before I do, I’m going to tell you the funny thing about investments: People never want to buy when an investment is cheap. It’s true. They always want to buy when it’s gone up in price. They believe they can buy high and sell higher. And sure, that can work. But what’s wrong with buying something dirt-cheap? That something — that contraryinvestment I’m talking about — is commodities. 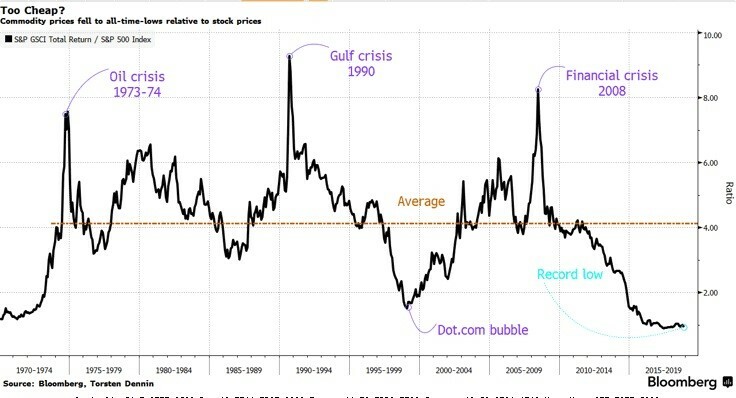 Commodities as a group have gotten stupid-cheap compared to stocks. Here is a broad basket of commodities — the S&P GSCI Total Return — divided by the S&P 500. Through ups and down, crises and manias, it has never been this low. Never! To be sure, this incredible ratio first happened in August. This bargain-basement condition has lasted longer than most people thought possible. It will not last forever. Historically, any time the ratio has gotten this low, the commodity index has bounced back very sharply. In fact, this likely won’t last for much longer. Uranium is obvious. Not only does the price of that metal keep inching higher, many stocks leveraged to it are stupid-cheap. Gold looks good. And many gold miners look cheap. Ditto for silver and silver miners. Heck, you could make a strong case for vanadium, lead, zinc and more. Do your own due diligence. You don’t have to buy everything. Heck, you don’t have to buy anything. But opportunities like this come along very rarely. This profit train will leave the station. And you want to be on it when the whistle blows. May your holiday shopping season be rewarding, indeed.